Shortstop Grant Green is the top position player available this summer (firebrandal/Flickr). Scouting Report: Wallace’s greatest asset is his approach at the plate. He has very good plate discipline considering his age as it generally takes some time to get everything in synch. But Wallace is the type of hitter who refuses to expand his strike zone and waits pitchers out, forcing them to throw him something he can make solid contact with. 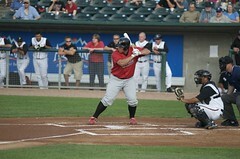 Wallace also does a great job in plate coverage thanks to his batting stance which crowds the plate. With his advanced approach, Wallace has the potential to translate his success to the pros and could end up being a perennial on-base machine. I project him a .280-.300 hitter, around .380-.400 OBP and a slugging percentage in the upper .500’s. Then add in his 25-30 homers and 100+ RBI and you have a pretty strong offensive weapon that Albert Pujols will love having hit behind him. With all that said, he is an average defender at third (I view him higher than most) who would be better suited to play first, but with that position locked up, he will do just fine at the hot corner (read my extended scouting report on Wallace with his “Prospect Spotlight“). Scouting Report: Some scouts have been down on Andrus saying he hasn’t developed offensively like they have hoped. I don’t think they are looking close enough at his numbers from last year as he got better progressively throughout the 2008 season and finished with a strong average. He possesses all plus tools except power which isn’t a big deal considering he looks to be the lead off hitter of the future for the Rangers. He is a very smooth ballplayer and you can see that in the way he conducts his business on the field from his swing all the way to the way he handles himself in the field. He’s an incredible runner and has really mastered the art of stealing bases. But what really has garnered him the most attention is his defense. He has a ton of range, soft hands and an accurate cannon for an arm. He looks to make the Rangers’ club this season and has a solid mentor in Omar Vizquel to help him adapt. Scouting Report: Colby Rasmus projects all plus tools and is the superior, impact-type prospect the St. Louis Cardinals organization has been waiting for ever since Albert Pujols was plucked from it. Some people are worried that Rasmus won’t be the same man since his injury last season, but there’s no proof of that. Rasmus is a perfect example of a five-tool player as he can run, throw, field, hit, and hit for power. He has very quick hands which gives him excellent plate coverage. Projects to have plus power and should be able to put up a fantastic stat line. Excellent bat speed, good pitch recognition, and plus runner. Not sure how much St. Louis will allow him to run once he reaches Majors but could have 20+ stolen bases per year. He’s doing an excellent job on his move to center field which is where the Cardinals desperately need someone ever since Jim Edmonds’ departure. Brett Wallace will put up some great numbers as a pro (phxwebguy/Flickr). In December 2007 I did my first collegiate list ranking the top five hitters of the NCAA Junior class. I had a great time doing this as the months prior gave me a great opportunity to start digging deeper into college baseball. My results were very much a mixed bag amongst readers as everyone agreed about the names on the list, however not everyone agreed on my rankings. My list from 12/8/07 had big names from this past summer’s draft including the top two on the list which caused the most discussion. Many people thought the young slugger from Vanderbilt, Pedro Alvarez, was the top hitter while I thought the more well rounded hitter, Brett Wallace, deserved the top spot. Needless to say there was a lot of good debate on the subject. While that was over a year ago, I still stand by my original statement and believe Wallace was the best overall offensive player from the group. In fact, in college Wallace was the 2007 Pac-10 Player of the Year as a sophmore when he won the Triple Crown. The best part of Wallace’s success and make-up is that his game will translate very well to pro ball. Scouting Report: When discussing Brett Wallace’s game we have to first start with his bat. There really isn’t any other direction to go since it is what makes him worth talking about. As I mentioned earlier, despite people who have strongly disagreed with me, I believe Wallace is the best offensive player that came from the 2008 MLB draft. While he may not have as much power of some of his fellow draftees, his overall offensive game is the strongest. First let’s start with his approach at the plate. Wallace has very good plate discipline considering his age as it generally takes some time to get everything in synch. But Wallace is the type of hitter who refuses to expand his strike zone and waits pitchers out, forcing them to throw him something he can make solid contact with. Wallace also does a great job in plate coverage thanks to his batting stance which crowds the plate. With his advanced approach, Wallace has the potential to translate his success to the pros and could end up being a perennial on-base machine with OBPs around .400. With having such a fine tuned eye at the plate, Wallace’s ability to be productive in the pros is pretty much set. But when you include his swing and the power he generates, you end up piecing together why he has the potential to be so special. We now move on to what happens when Wallace finds his pitch. As I mentioned earlier, Wallace tends to crowd the plate which gives him great reach for the entire plate. This allows him to reach the outside corner and his short stroke allows him to turn on inside pitches. He also keeps his hands held high in the air and keeps his weight back allowing him to help generate power and use as a timing mechanism. Wallace’s short stroke goes right through the ball which follows up with a very hard uppercut swing. His swing is built to be a line drive, gap-to-gap hitter but he is strong enough and has the bat speed to hit homer totals into the 30’s. Wallace has a fantastic appraoch (mwlguide/Flickr). If I were going to portray his skills to what they would translate to in the majors, I would say he is a .280-.300 hitter, around .380-.400 OBP and a slugging percentage in the upper .500’s. Then add in his 25-30 homers and 100+ RBI and you have a pretty strong offensive weapon that Albert Pujols will love having hit behind him. On the defensive side however, things aren’t quite as rosy. Wallace’s offense has never been questioned but his defense has always been something he’s criticized for. Wallace would be best suited to play first base but we all know that position is going to be held down for quite a while in St. Louis. So third base looks to be where this kid will be saddled while with the Cardinals. Many don’t think he is athletic enough to stay at this position but unless the Cards intend on trading him, there really aren’t many options with no DH rule in the National League. By simply looking at him you would automatically assume he won’t be able to play the hot corner. Sometimes I wonder if this is as deep as many scouts dig into his defensive abilities and just label him as a liability there. But the truth is Wallace does have some quickness and the feet to play an average third base. He also has pretty good hands and a fairly strong arm. Not exactly a glowing recommendation, but it is what it is. While all this translates to an average third baseman, where I worry is in his ability to react to hard hit balls. I mentioned earlier how he has some quickness, but perhaps not enough to compensate on balls that are smashed in his direction. This could partially be counteracted by where he positions himself depending on the hitter, count and situation, but you really can’t coach reaction time which could be a giant flaw in his game. Basically I don’t see him killing his team with his defense, but I don’t see him helping at all either. 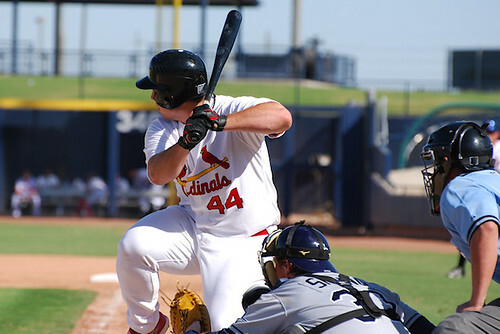 Overall Brett Wallace is going to be a solid player for the Cardinals for many, many years. If they can just get adequate defense from him at third they will have found themselves an All-Star offensive weapon that will be able to protect Pujols in the lineup. Scouting Report: Stanton’s plus plus raw power is, for a lack of a better word, incredible. Perhaps the most powerful bat in all of the minors, what sets him apart from other power hitting prospects is that their power is usually projected, his is already here. He’s a big kid who fits into the prototypical right fielder/clean-up hitter mold. He has shown a lot of growth in the field thanks to his strong work ethic and dedication to getting better. He has improved not only in the field, but also at the plate as he has worked to fill some big holes in his swing. It can get long at times which leads to a lot of strikeouts. In fact a perfect comparison that I use with Stanton is that of Adam Dunn. Both fit into the same risk and reward categories with each at bat resulting in a homer, a walk or a strikeout. Since I’m a fan of Dunn, I am definitely a fan of Stanton and can’t wait to see him hitting behind Hanley Ramirez for years to come. You are currently browsing the archives for the 2009 Prospects category.